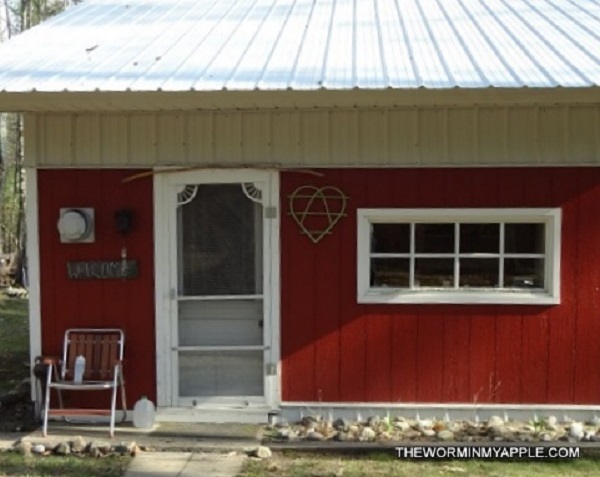 Finally you get to hear about the teeny, tiny, red cabin in the woods. Nine years ago the company my husband worked for was sold and we were facing possible unemployment. We’d been praying ever since we knew. I had just come home from teaching an evening Bible study when the phone rang. When have you ever heard of a company calling an employee after nine in the evening to offer them a job? But that’s what happened. The corporate office had had a board meeting and decided to offer him a position as a forensic accountant. (That’s an accountant who looks for the bad guy.) The position would involve extensive traveling within the contiguous United States. However, the job “morphed” after a year to encompass mostly international travel. Cool, huh? Well, yes and no. At first we were thrilled as we both love to travel and we were hoping I could go with him sometimes. But when the schedule became two weeks home and two weeks traveling and now it was international travel which complicated our lives greatly, it got really old, really quick. We look back now and wonder how we managed as well as we did. As it turned out, I was able to travel with my husband a couple of times a year because his hotel room was already paid for and my airfare was covered by his frequent flyer miles which racked up in quick order. I only had to pay for lunch which was either leftover breakfast or something from a grocery store. As far as shopping, I did very little. The same year we learned about the international travel is when “teeny, tiny red cabin in the woods” became a reality. The teeny cabin became our retreat from a very hectic lifestyle. It was calming, therapeutic and revitalizing all at the same time. It was and still is our “honeymoon” place. The extensive international travel is now over. Ten years was enough. Here’s some fun facts about “teeny, tiny, red cabin in the woods.” It sits at the bottom of a hill. Our main home sits at the top of a hill. Both houses are over one hundred years old. Apparently, I like old. Two end tables with legs that look like branches. We purchased a new futon (who wants to sleep on a used mattress?) and the log style bed that was already in the cabin. A dear friend made me two birch-branch lamps, one floor-sized and one table-sized that found their way to the cabin. Everything was inexpensive. I’m a natural-born thrift shopper. I love repurposing things. Modestly aside, most people like how I decorate. Plus shopping at garage sales and thrift stores makes me use all my creative juices.